The Duke and Duchess of Sussex aka Prince Harry and Meghan Markle rounded off their first Royal Tour of “Down Under” with four days in New Zealand. Markle has created a sartorial stir around the world not only for her elegance but also for her apparent support of local, ethical designers. Greg Harford, Retail NZ spokesman, knows the importance of having Markle spotted in local designers. “There’s no doubt that being supported by Prince Harry and Meghan is outstanding news for any business or brand,” said Harford. “The likes of Karen Walker will likely have seen an immediate boost in sales from having the Duchess wear her products”. Markle has previously been a fan of Kiwi designers Emilia Wickstead and Karen Walker, so her tour wardrobe was highly anticipated. We couldn’t wait to see who she would be wearing during the four days in the country. Here is a breakdown of the New Zealand designers she wore. Prince Harry and Meghan arrived in Wellington. Wearing a Karen Walker Banks Trench coat and simple ASOS maternity dress, Meghan looked comfortable and refined. 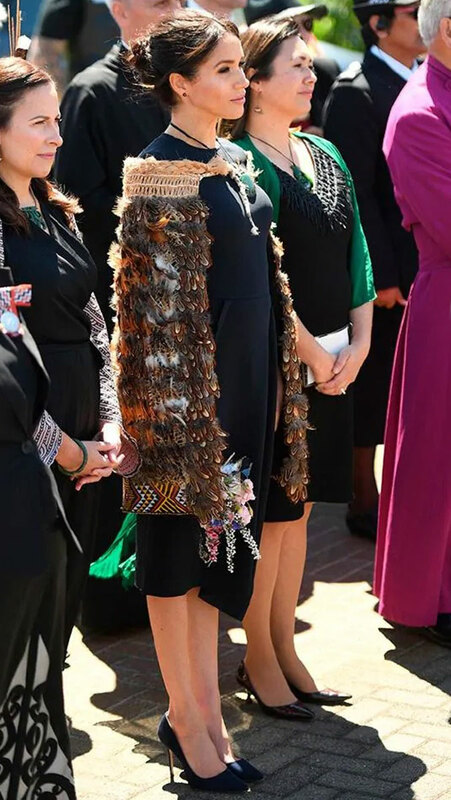 “It’s really exciting to see the Duchess wear the coat that we’d worked on, but it’s just as exciting seeing anyone else wear it,” said pattern designer Kerry Ranginui, who created the latest version of the coat. Ranginui is currently appearing on Project Runway. The Banks Trench has now sold out on Walker’s website. It retailed for $975. Later, Meghan wore a Tattoo Diamond Pendant by Jessica McCormack to their evening event with Prime Minister Jacinda Ardern. The Duchess of Sussex was glowing in a sustainable Leap of Faith sleeveless tuxedo dress by Maggie Marilyn at the ‘Things That Go Bump In The Night’ exhibition. The exhibition showcased some of New Zealand’s top creative talent. Meghan also wore a ‘Tattoo’ necklace by New Zealander Jessica McCormack (who is currently based in London) that was inspired by traditional spiral motifs found in Ta Moko. At their first event in Auckland, the couple unveiled a plaque to dedicate an area of native bush to the Queen’s Commonwealth Canopy and meet children from the “Trees in Survival” group. Meghan wore a blue Fathom Karen Walker jacket, J. Crew jeans and Muck Boot Company boots. The couple visited Te Papaiouru Marae where they attended a traditional Māori welcoming ceremony called a pōwhiri on their final day. Both Meghan and Harry were dressed in traditional Korowai robes. Meghan accessorised with a stunning Kiri Nathan Pounamu Necklace hand-carved from New Zealand greenstone. Pounamu is traditionally handed down as a valued heirloom or given as a gift to affirm relationships, peace, love and safe journeys/life. With so many excellent New Zealand designers to choose from, Meghan’s tour wardrobe was safe. It was her choice of accessories that really made her outfits.